Mirror, mirror on the wall, who’s the cutest of them all? Well well well, it’s the newest Louis Vuitton Reversed Monogram Camera Box Bag! The perfect feminine day-to-evening small bag companion, this one pairs easily with most looks. With its cute size and overall look, this camera box bag deserves another feature. Made from Monogram & Monogram reverse canvas exterior with microfiber lining, this latest addition from the Fall/Winter 2016 Collection is our favorite! It features a Toron top handle for easy hand carrying, golden coloured metallic pieces, and a studded top & bottom with metallic brackets. It features the Signature lock closure that we absolutely love! Its removable adjustable leather strap is also functional and practical. Taking a look inside, it has an inside flat pocket. Who would have thought that a backpack could look as luxurious and elegant as this? Introducing the Louis Vuitton Monogram Reversed Palm Springs Backpack. Delicately and meticulously fashioned in Monogram Reverse, the trendy size and shape of this backpack is the perfect go-to bag for the sporty urban drifters, in tune with the athletic silhouettes seen on the runway. One might think it looks too bulky but fret not for the truth is that it is a very lightweight backpack to carry around. Its relaxed construction and built makes it a comfortable and practical companion to have wherever you go. Now let’s talk more about the bag details. The Monogram Reversed Springs Backpack from Louis Vuitton features a Monogram canvas exterior, golden coloured metallic pieces and an adjustable padded leather shoulder straps. On the other hand, the interior offers a double zip closure, an external zippy front pocket, and an internal flat pocket. Crafted from soft calfskin, this backpack is extremely light-weighed. Who would have thought a camera box bag could look so stylish, posh, and luxurious all at the same time? 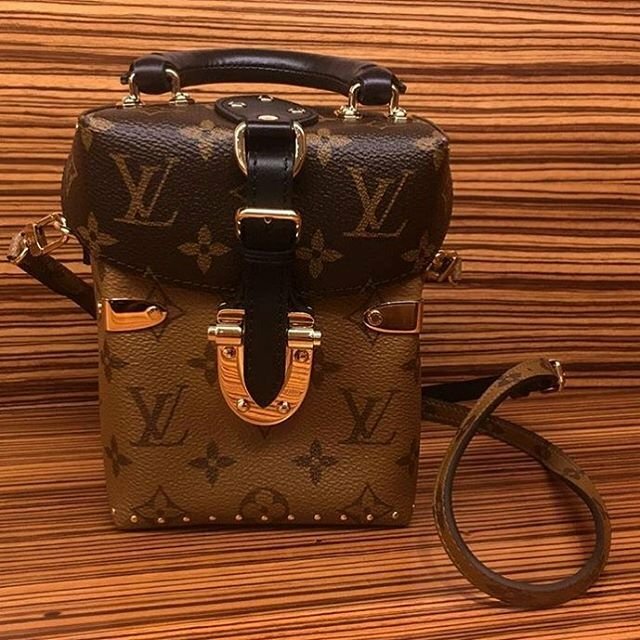 Well well, things are about to change with this Louis Vuitton Reversed Monogram Camera Box Bag. Dubbed to be the cutest bag of the Fall/Winter 2016 show, the Louis Vuitton Camera Box in Monogram and Monogram Reverse canvas is both functional and fashionable. Its signature details evoke the House’s legacy of trunk making but are especially adapted to the everyday needs of the modern-day urban woman. Aside from its Monogram print, this bag is equally gorgeous with its golden colored metallic pieces, Toron top handle, and its signature lock closure. It also has a removable, adjustable leather strap for easy carrying. The interior is enriched with a large compartment and an inside flat pocket. Measuring 11 x 15 x 8 (L x H x W) cm and is priced $3950 USD, $4850 AUD, $32500 HKD, ¥465480 JPY and is available via Louis Vuitton boutiques. First the relatively good news – one of the bright spots from Fall/Winter 2016 show is the Louis Vuitton Camera Box. The bad – to say Louis Vuitton received an underwhelming response to Nicolas Ghesquière’s F/W 2016 Collection is an understatement. These days there are plenty of rumors making rounds about Nicolas’ future with the company. If that is not enough, because of falling sales they are closing 3 stores in China. So, lots happening right now in the LV universe. Let’s have a look at the bag LV called “the cutest bag of the Fall/Winter 2016 show”. More or less this is the slightly taller and boxy cousin of the Petite-Malle, Ghesquière’s first trunk-inspired bag. There are three different Camera Box versions with LV’s signature Monogram taking center stage. First one combines Monogram with smooth black calfskin for a more traditional look. The second, Monogram and Wild Animal print are there to add a bit playfulness to a girl’s busy day. Monogram on Monogram Reverse is a tribute to LV’s monogram canvas. Borrowing details from their iconic pieces for new creations is in LV’s DNA, the Camera Box is no different. The 1970s camera cases inspired design has a lock first appeared on the Citroën trunk – the special trunk carmaker Citroën had commissioned in 1924. It also features a removable strap for shoulder carry and a Toron top handle to hold in your hand. Metallic pieces including studs, microfiber lining and calfskin trim completes its stylish look. Disagree with Louis Vuitton’s “feminine day-to-evening” description for the Camera Box, I think the bag is more suitable for daytime. To me its not glamorous enough for the evening, the same way the Petite-Malle is. Nonetheless, a very stylish bag. If you want it, be ready to folk out $3,950, complimentary shipping within US included.